Severe earthquakes often shake entire regions across the world. Over 2 billion people live in danger zones and many of them in structures not designed to withstand an earthquake. Researchers at the Fraunhofer Institute for Wood Research WKI, together with collaborators from industry, are developing building materials to prevent buildings from collapsing during a natural disaster. Since earthquakes repeatedly claim too many lives, experts are tracing this to lack of preventative measures, particularly with regard to construction and failure to comply with standards. Too often, structures in danger zones are not designed to withstand an earthquake – a state of affairs that the Center for Light and Environmentally-Friendly Structures of the Fraunhofer Institute for Wood Research, Wilhelm-Klauditz-Institut WKI, is now seeking to tackle. Working along with the Technical University of Braunschweig’s Organic Building Materials and Wood Materials division from the Institute for Building Materials, Concrete Construction and Fire Protection and industry partners such as Pitzl Metallbau from Altheim, the Researchers are developing solutions for the construction industry that could help save thousands of lives. Presently, Fraunhofer WKI Engineers are developing an ultra-durable bracing that would protect even high-rise buildings during an earthquake. This bracing is composed of sensor-controlled steel connectors that provide a high-level of rigidity while remaining elastic enough in order to maintain structural integrity despite severe shaking. Various tests have showed that the connectors function exactly as intended. In one test, the Scientists examined the nature of the stress being placed on structures by using dynamic, cyclical and static forces; in another test, the service life of the structure was investigated using environmental simulation. This method is based on the successful EU SERIES project, which explored earthquake-resistant structures under dynamic loads. The earthquake-resistant bracing has been developed for buildings with a mullion-and-transom design, and it connects the horizontal beams and the vertical post. When exposed to tremors or wind, the connectors should be sufficiently rigid to keep deformation to a minimum level – but also sufficiently elastic to withstand strong earthquakes. However, if deformation occurs, it does not lead to critical stress, in other words, the building structure sways, but does not collapse. The connectors slide over each other during an earthquake and convert kinetic energy into frictional energy, preventing the building from collapsing. The trick is using friction to dissipate the force. The individual parts of the connector are pressed against one another applying a significant, pre-defined force. When the specified stress limit is exceeded, they begin to slide over each other. Therefore, without compromising structural integrity, it is possible to accommodate structural deformation. Even after a severe earthquake, this structure maintains the same capacity as before, and can still handle the stress placed on a multistory building. This indicates that buildings can withstand many quakes with no significant damage. In a sense, these buildings surf the earthquake wave. “All the weight-bearing, safety-critical materials are just the same after the earthquake as they were before it,” says Rüther. It is very simple to install the bracing within a building, and it does not need any maintenance. In addition to this, the Fraunhofer Institute for Surface Engineering and Thin Films IST has designed pressure and temperature sensors that are integrated into the connector. This means, it is possible to measure the stress and forces associated with an earthquake. Fraunhofer WKI has developed bracing connectors that can be placed to accommodate the individual application requirements – the way in which bolts are fixed and tightened, for example. It is also possible to adjust the connector geometry in order to suit both the structure and the materials used. Our high-performance connectors are compatible with any material and support structure – including concrete, steel, brick and wood. Wood is extremely durable, light but still stable, and perfect for earthquakes. In its mechanical properties, it compares very well with highly durable composites – though at a significantly lower material cost. Many countries are skeptical about using wood in such situations, citing the danger of fire. However, there are good solutions that deal with this threat. For example, solid wood elements with large profiles are highly resistant to fire and can maintain their load-bearing integrity even after hours of exposure to fire. Currently, the connectors are in the prototype stage, and they are projected to be ready for full-scale production in one to two years. 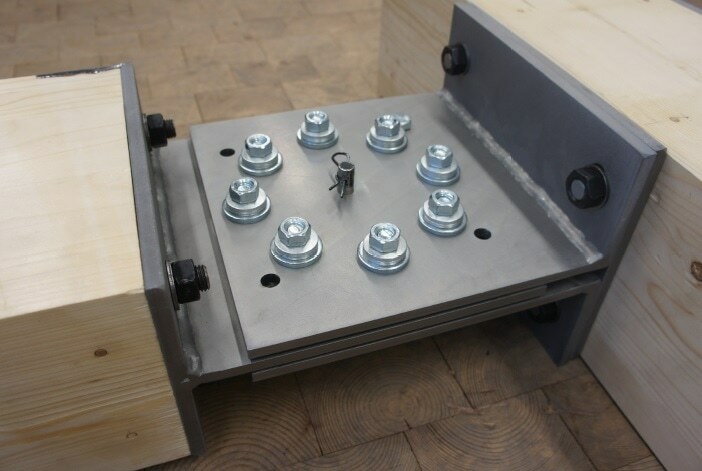 The experts are currently exploring the economic viability of the connectors for testing in real buildings. As all other components are exposed to linear-elastic stress, there is no requirement for any further safety contingency – in turn improving the overall cost-effectiveness of the structure.